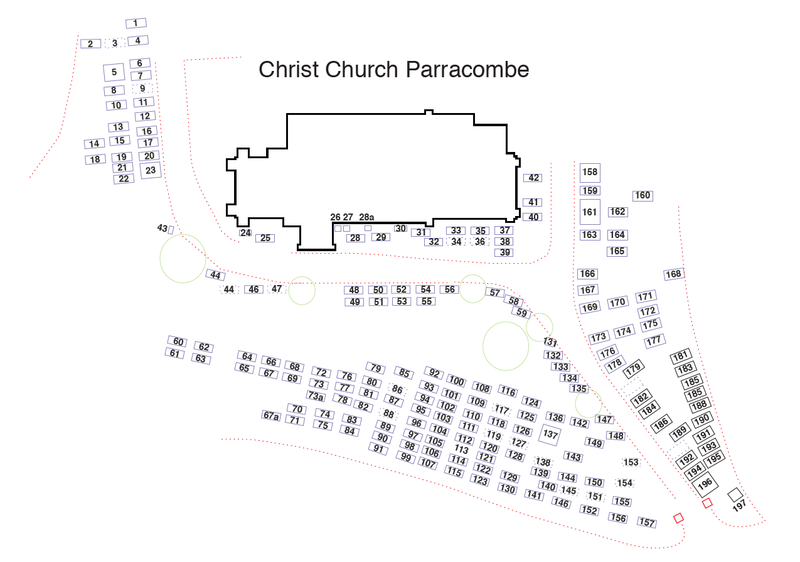 The graveyard of Christ Church Parracombe was recorded by Parracombe Archaeology and History Society (PAHS). Each grave is recorded below with a reference number and inscription. The reference number refers to the location recorded on the churchyard map of graves. 4 Annie Harding ANTELL passed away April 3rd 1934. 57 George ANTELL passed away August 17th 1932. Aged 86 years. 162 Elizabeth H. COURT (Bessie) died 5th Sept.
50 Albert William GOODING who passed to rest March 27 – 1926. 31 Annie Maria HAYDON died aged 60. Arthur PARKHOUSE passed away Sept. 1st 1969. 14 Adelaide Sara PAUL 16th August 1958. 184 Harry PETHERICK died July 26th 1972. 16 Daisie Julia RIDD who passed away May 16th 1929. 17 Richard Charles RIDD who passed away February 26th 1949. 56 Lilian SLATER died Candlemas Day 1926. Hannah SMYTH died 26th October 19??. 157 Arthur L. SMYTH died 1981. 174 Thomas WHITE died, April 7th 1904.